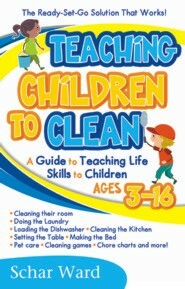 This book contains step-by-step instructions for teaching children and teenagers to clean an entire house. Plus many other life skills such as doing laundry, loading a dishwasher properly, and making a bed. Knowing how to take care of yourself in your everyday environment is a skill no one should be without! Meet the author, click here to view the Twin Cities Live cleaning demo. Schar Ward credits her mother with instilling in her many years ago a passion for cleaning while living on a farm in Linn Missouri. At the age of twenty-one, she married and moved with her husband to St. Paul, Minnesota, where she began a job as a professional housecleaner. Her meticulous cleaning soon put her in demand. In 1973 she started a small residential cleaning service. Within a short time, her service Domestic Engineering had grown to the point that she was employing several people and found herself with a corporation. She realized the need for people to learn to clean properly and used her experience to write helpful cleaning books, she also began giving workshops that combined humor and hands-on cleaning help. Schar has appeared on HGTV, done television tours for Lysol, Murphy Oil Soap and Borax. She was the Green Cleaning Lady on the Twin Cities Live show in St. Paul, Minnesota for two years, wrote a column for Dog Fancy magazine teaching natural cleaning for dogs and has published numerous newspaper and magazine articles on cleaning. Schar's other home care books, Coming Clean: Dirty Little Secrets from a Professional Housecleaner and It's About Time: Time Saving Tips for Every Day - Home or Away, have helped thousands of people gain control of their house. She lives in Stillwater, Minnesota and keeps happily busy, teaching the world to clean.